The Mauviel saucepan is a 1.5 quart size created for reducing sauces, preparing soup, or melting butter. 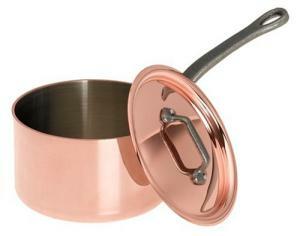 The exterior of the pan is made from thick 2.5 mm copper for incredible heat distribution and control. The interior lining is stainless steel. It won't react with foods and cleans well. The handle is varnished cast iron with stainless steel rivets. Hand washing is recommended and a limited lifetime warranty accompanies the pan. The complexities of your flavors are preserved through the function of the lid, which seals in moisture and nutrients, and through the properties of the copper, which allow more control over the intensity and duration of applied heat. Since the exterior copper layer provides 90% of the material of the pan, its properties really power the pan's performance. The saucepan has a rolled edge for ease in pouring without stray drips and is oven safe. Mauviel began in the city of copper, in Normandy, France. Knights from the time of the Crusades taught the craft of manufacturing with copper, and Villedieu Les Poeles has been the center of manufacture for the world's copper cookware since. Mauviel began there as a family business in 1830 and continues generations later, still a family business and still dedicated to quality, professional cookware.